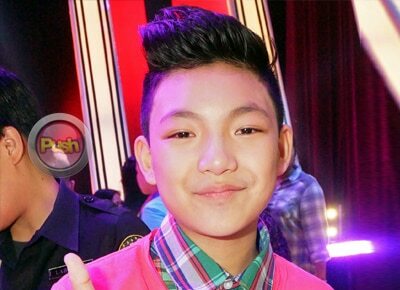 Darren Espanto remarked that he feels blessed to be part of The Voice Kids Top 4. The young singer extended his gratitude to those who supported him in his journey in the competition. "I fell very blessed and I feel very excited and happy. I feel very happy that there are a lot of people supporting me and my message to them is thank you for the support and thank you for believing in my talent and for believing in me," Darren stated in an interview with Push.com.ph. Darren relayed that he is overwhelmed of the massive support that he is receiving from the viewers. "When I was in blind auditions, it was just so cool to see my followers just starting boosting up overnight and it’s just so amazing and I felt so excited and I felt so happy because I didn’t expect that many people to watch my performance so I guess they believe in what I can do." If ever he will be hailed as the grand champion of The Voice Kids, Darren plans to give the house which is part of the prize, to his co-contestant Lyca Gairanod. “[If manalo po ako] the prize po ‘yung pera po ano sa simbahan po tapos po ‘yung bahay po ibigay ko na lang po, kay Lyca ko po ibibigay ‘yung bahay,” he relayed. If opportunities will come pouring in after the competition, Darren said he plans to stay in the Philippines for good while his parents will return to Canada where he was raised. “Magsta-stay po ako dito if ever po manalo ako, ako lang po ‘yung mag-stay, tapos po [‘yung parents ko] they will go back,” he shared. Darren said that he is truly being inspired by a lot of Filipino singers in the country. “[Idol ko po] sila Martin Nievera, Gary V., Jed Madela, Lani Misalucha, coach Sarah (Geronimo) and Angeline Quinto, a lot of people,” he said.